Search Servers work by searching an index rather than the actual files in the database. Some Search Servers need to have their indexes optimized once in a while. If Solr is your ‘only’ Search Server, no action is required. This is because indexing Solr hardly takes any time at all and is therefore done automatically/implicitly during the Solr indexing process. 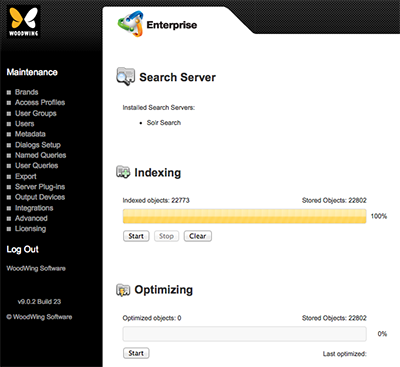 If you have a Search Server installed other than Solr, check its documentation to find out if optimizing is required. When in doubt about the above mentioned bullets, or if optimizing is required, follow the steps below. Step 2. In the Optimizing section, click Start.